Children with autism and their families from the ASP Pasay Chapter were privileged to be invited to SM Mall of Asia last 29 November 2014 to a front-seat view in the celebration of Parade of Lights 2014. 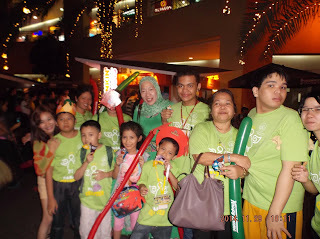 The children truly enjoyed the experience of watching the parade as different cartoon characters and floats marched in their colorful, lighted costumes, in tune with the Christmas carols in the background. Even with the signs of impending rain, you could still hear the audience shouting "WOW!" whenever a new float passed by. Nobody moved from their spots until the culmination of the show. It was truly an amazing experience for the kids and even the adults enjoyed the event! About the contributor. Hilda Cristobal is blessed with four children and one grandson. Her youngest son Jared Kevin, now 19 years old, lives with autism. This BS Criminology graduate serves many non-profit organizations. Since 2008, she is the treasurer of Ladies Circle 185, which aims to establish camaraderie and to empower women in the communities in Pasay. Hilda serves as ASP Pasay Chapter President.